There’s a widely held opinion among my friends who are clergy that Ash Wednesday ashes should be removed rather promptly following imposition to avoid presenting oneself has haughty for being “more faithful” than those who do not have their ashes (at all or yet). While I certainly understand the sentiment, especially after hearing stories of those affected by such haughty stare-downs of the ashed faithful when their Ash Wednesday service was in the evening, I wonder if so quickly removing our ashes keeps us from recognizing, or focusing upon, their significance. She continues … ‘I tossed a handful of my friend’s ashes into the water way out past the Golden Gate Bridge during the day. They’re impossible to let go of entirely. They stick to things, to your fingers, your sweater… And they blow every which way. We tried to strew them off the side of the boat romantically, with seals barking from the rocks on shore, under a true-blue sky, but the ashes would not cooperate. ‘They rarely do,’ she says. ‘It’s frustrating if you are hoping to have a happy ending, or at least a little closure, a made-for-tv moment when you toss them into the air and they flutter and disperse. They don’t. They cling, they haunt. They get in your hair, in your eyes, in your clothes.’ Reality is often grungy, isn’t it? I resolved to leave the black smudge under my nail until some future, final hand washing removed it. I cannot remove my humanity no matter how hard I try, and neither should I! Christ himself chose to don the ashes of humanity to come live among us. How much more should I appreciate my ashy existence in this world! I figure there’s probably a happy medium to be struck between how long we wear our ashes to remember who we are, versus how long we wear them to remind others we’ve been to church. But, for the immediate washers of their ashes and those who wear their ashes from morning until their pillowcases are grimy, perhaps we shouldn’t worry about when we (or any one else) wipes it off. 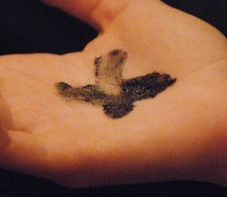 Instead, we should simply use those smudgy, ashy crosses (or nail grime) to remind ourselves in this season of Lent that we are indeed dust, ashes that stick around and are messy and imperfect – and that sometimes no matter how many washes we undertake, we’ll have it stuck under a nail for hours and hours. Yet God remains faithful to God’s children, mess, ash, and all. I am eternally grateful for divine mercy for all of God’s ash-covered children, my dingy thumb and self included. This whole process has made me feel powerless. I was working along, minding my own business, when the connection stopped working. Nothing was wrong with our “box” and no amount of restarting all the devices could make it work again. And no matter how many times we called the internet provider, they still had techs only available to come out two days later. They kept telling us there was nothing they could do. And so, I sat, powerless to change my situation at home. But the thing about powerlessness over situations is that we are in fact empowered then to do something else. I was empowered to shut down the laptop and take the night off. Empowered to go on an impromptu date night with my husband that turned out to be extremely fun. Empowered to find a new place to sit and work the following day, which turned out to be nice because I was able to work face-to-face more with my coworkers here at church. I got out of my work-at-home doldrums and got to dress up and say hi to other humans (and not just my happy, but non-human doggies). My role this week was acceptance. I couldn’t convince others to do things on my schedule. I couldn’t change my internet connection situation. I had lots of courage to try, but the internet company had no appointments. And so, I had to accept my fate of being an internet nomad in search of a WiFi singal so I could work. But where the serenity prayer stops, we should not. Acceptance doesn’t mean stopping. Once we accept, we can then do something with that knowledge. In my case, I could try something new, get out of my routine, and keep a positive attitude. I could find new ways to approach the unchangeable that were life-giving. I didn’t have to sit in pained, silent acceptance and do nothing in my disconnected apartment. Life is a series of things we cannot change. No matter the amount of courage we have to change things we can, some are impossible to change (at least on the schedule we would like to). These could be nuisances like a lack of internet or a locked car door, or they could be major life circumstances like cancer, sudden death, the struggles of aging, or illness in innocent children. We just cannot change things sometimes. No matter how much we try, these things simply are. And we are left with knowing that we cannot change them, and then finding ways to live in them, through them, and make the best of our lives as we accept them. As we face life’s challenges, we are going to overcome many things by having courage to change them. But when we cannot change things, I pray that we instead find ways to integrate them into our lives in positive ways. For the “small stuff,” it can simply take a positive attitude and some ingenuity; for the bigger things, it may take days, months, or even years to find ways to live into God’s meaning in our lives as we face these hardships. And the grace to find new ways to live in spite of the things I cannot change. Why yes, it is. RRCB has one of the most beautiful and meaningful worship service structures I have ever attended or been a part of. It has the depth of meaning, the story-in-song, the aesthetics of a cathedral, all with a Baptist, soul- and Bible-affirming twist. And when we’re not worshiping, we’re doing the work of the Body of Christ. We are feeding the hungry, creating community, visiting the sick, affirming one another. And yet – do you ever feel like you or someone you know involved in so many activities suddenly realizes that doing this, while it is philanthropic and good, no longer touches your soul in ways that God becomes more present? Perhaps it is because you’re too busy to see Jesus (e.g., Martha). Perhaps you just never “got” the whole life-as-prayer or devotional time; it feels awkward. Perhaps there is still some doubt as to the veracity of God, but you definitely see good people and want to be a part of their good work in the name of this God you haven’t really gotten to know yet. We are all somewhere on this faith journey. I think it can be easy for us to fall into the trap of good works. Not in the self-righteous sense, but in the sense that we are doing a lot of good work with good hearts but never finding the “God moments,” missing the connection to the Divine in our work. In his sermon this past Sunday, Mike Clingenpeel told us how very connected we are with technology and yet how very disconnected we can become from our Source, the Vine to our branches. So, what are we busy Christians to do about this disconnect? How do we stop being religious but not spiritual? I think the answer lies in our recognition that our spirit needs the same hard work as the missions we endeavor to pursue as a congregation. One theologian, Baron von Hügel said that we have three dimensions: the intellectual, the institutional, and the mystical. We must nourish all three to be well-rounded People of the Book. That mystical, or spiritual, part of us is often lost in our very logic-laden, post-Enlightenment, exuberantly busy world. We want neat, tidy ways of doing life. But mysticism seems to “waste time” and requires a lot of sitting alone and cultivating personal disciplines that will interfere with our daily lives, force us to face our deepest fears and longings, and drive us to see everything we do in a new Light. Take a walk. Focus on your body’s rhythm – heartbeat, breathing, muscle tensions. Breathe in the freedom of being outside of a box (room). Imagine yourself on a walk with God. Look up at the sky or tall trees – see the vastness of creation. Pray. Many of us are quick to offer a prayer of thanks for a meal or a request for something specific, but perhaps extend your “praying as talking to God” (mostly asking for things) to include praying in other ways that inform communication with God: Gratitude, Praise, Wonder, Confession, Complaint, and all the other ways we relate to other people. Prayer is not just one way of speaking, it is all communication we have with the Divine. It is our whole relation to God. Broaden your relationship with God but broadening your practice of prayer. Write about your life. You could start by placing your date of birth and today’s date on far ends of a sheet of paper. Revisit places, time periods, events in your life (whether spiritual or ordinary, as both affect us). Which of these major events or places or people in your life have most affected how you view Creation, God, Church, and good works? Which of these moved your soul? As Denise Bennett told us on Wednesday night at Telling Our Faith Stories, the process of telling our faith stories begins with outlining those parts of our lives that have meaning. When did you receive or give a particularly meaningful gift? What place in your life holds sacred value? How does your family celebrate, mourn? Do you have unconventional family members or friends? Who has shaped you? After you have written these down, begin to share with trusted friends your journey. Ask them the same questions. Christian friends walking this same spiritual journey with you will provide space to be accountable for disciplines and to share, laugh, and have community together as you experience God in deeper, more profound ways in this walk of faith. The winter season. The new semester. The new financial year. We are firmly into 2015, and already it may seem to some of us that the year is out to get us. We have so much to do and so little time to do it. Combating stress and worry is rarely simple. Most of us struggle to “leave it to God” or remember that God’s “eye is on the sparrow, who neither reaps nor sows.” Are there ways to approach stress through our faith positively without simplifying a deep struggle? Yes, I think so. How can we begin the process of alleviating our worries? First, seek help. The darkness of winter days and the end of a brightly-lit season can leave anyone feeling down. Add to that the stress of a new year and new responsibilities – well, you get the picture. There are pastors at your church, friends in your community, and professional health care members who are dedicated to supporting you. Don’t let that opportunity pass you by if things are tough. Second, say “no.” There is no shame in saying “no” for your own health. Many times, those of us who are heavily involved, caring people often think that if something is to be done we must do it ourselves! But this is far from true. If a project or activity overburdens you, ask for help! Crashing and burning will prevent you from doing your best on the next project. Say “no” to the one now that induces more stress and trust those around you to handle things in your absence. Third, understand that worry is not a character flaw. It is both a mental/physiological state (some of us struggle with more worry than others due to our neurotransmitters and life circumstances), as well as a spiritual/soul state (we all struggle to trust God and are friends of Nicodemus, who just could not understand how simple God’s grace is). There will be many parts of life that create for us stresses we can hardly bear. And to be ready for those times, we must prepare beforehand or be ready to stop when necessary. Worry is certainly normal and understandable. It is also beatable, with work, time, and support. What are some spiritual ways to alleviate and/or prevent excessive worry? Open space in your days for quiet. This will be difficult for many of us – we are overscheduled, overworked, and overtired. But space in one’s day leaves room for God’s Spirit to groan for you as you work out your stressors. This time of no connectivity (turn off that phone, email, TV, etc.!) will not only allow you to empty space into silence, but it will also create space for God to speak to you in that still, small voice. Open space in your week for movement. God created us with whole bodies. We were never meant to sit at a desk and worry. God made us to move, interact, and be alive in so many other ways. Whether it’s a walk through the neighborhood with family or friends or dogs, or some roughhousing with the grandkids, or simply making sure to move around in some small way every day, it will make a difference in your stress level. The scientists tell us that sitting is no good for our body chemicals, but moreover, most of us feel the effects of a motionless life as we try to face our daily stresses with so little strength. Get up, get moving! Whatever is true, noble…praiseworthy – think on such things. Our over-committed culture is also predominately negative. We only criticize ourselves; we don’t lift ourselves up. To stop worrying about one’s appearance or successes as a primary focus, one must first change the inner negative voice. This might require some professional help, or it might simply require a daily inner reminder about that voice. If there is space to hear God, listen to that voice, not your inner gremlin. Thoughts of the Spirit are true, noble, and praiseworthy – not negative or hurtful. When Paul wrote to the Corinthians, he said “Faith, Hope, and Love” are the backbone of Christianity. Faith, not worry. Faith that God will provide (Hope). And Love to conquer all Fear. May you find ways to move your Stress to Faith and thus embrace God’s Hope and Love. And may we all support each other as we work toward better balance in our lives – Mutual loving relationships are the only way we will all be able to make space for God among us and alleviate each other’s struggles even as God works in our inner selves. A devotion I wrote for FBC Chattanooga’s Advent Devotion book. Many thanks to Jeanie & David Gushee for their compliation of Christian prayers (Yours Is the Day, Lord, Yours Is the Night), which added so much to this devotion. 1 In the beginning was the Word, and the Word was with God, and the Word was God. He was in the beginning with God. 3 All things came into being through him, and without him not one thing came into being. 4 What has come into being in him was life, and the life was the light of all people. 5 The light shines in the darkness, and the darkness did not overcome it. There is much talk about light and hope during Advent season. We all try desperately to focus not on ourselves, but on the light that Jesus, the Word made Flesh, brought to earth when he was born. But in the midst of millions of tiny colored, sparkling lights, the days get shorter and colder…and darker. This time of year sees the most suicides and depression. This time of year can consume us with loneliness – whether through the loss of a loved one or simply a sense of loneliness when we feel alienated by bustle of the season. What is so beautiful, I think, about the promise of the Light of the World is when it falls in our calendar – at the darkest time of year (and perhaps the darkest time of life). Holidays may bring loneliness or remind us of a bygone year of pain. We might have gotten divorced, lost a child, parent, or friend. We might have made poor decisions and be filled with regret. We might be spending our first Christmas alone. We might sob during the long, dark nights of December. Light and hope are the last things on our mind. But this, I think, is when we can most find comfort in Advent worship. We don’t need to start out joyful – we come to the manger as we are: sad, lonely, hurting, depressed. And we find comfort, community, love, and acceptance. Jesus is the Prince of Peace because of the offering of love and community at his table. Christmas worship is as much about being joyful as it is offering the love of Christ to others to create joy in community and love during the darkest days of the year. Come, true light. Come, life eternal. Come, hidden mystery…Come, reality beyond all words. Come, person beyond all understanding. Come, rejoicing without end. Come, raising of the fallen. Come, resurrection of the dead. Come, my joy, my endless delight. Calm amidst the storm(s). Looking at some ways we can practice faith when everything else in life runs counter to it. Tonight we are going to look at the life of St. Benedict of Nursia, a monk who lived many centuries ago, and take a few minutes to think about how his Rule can help guide our faith in profound ways today. We’re no monks, but we are Jesus-followers, and tonight we’re going to explore some tools that might just make our spiritual lives a little more vibrant – in spite of the obstacles in our lives. St. Benedict lived from about 480-550CE. His teaching “upholds the highest ideals of Christian love and asceticism in an uncompromising yet humane spirit…his Rule for Monasteries has become the most popular and commonly used rule in the West. In this remarkable little document, Benedict describes the monastery as a ‘school for the Lord’s service’ and proceeds to outline the contours of life in a monastic community characterized by balance and simplicity…he teaches the three foundational virtues of the monk: obedience, silence, and humility…[His rule] was acclaimed for its moderation,” [but also was] “unbending in its expectation that each monk would be present at all community gatherings; and his emphasis on the exercises of prayer …illustrates Benedict’s conviction that the thoughts of the monk must at all times be occupied with God.” (Spiritual Traditions for the Contemporary Church, 65). “Rather than extreme asceticism, what the Rule seeks is a wise ordering of the monastic life, with strict discipline, but without undue harshness.” Additionally, Benedict’s rule required stability – monks did not move or leave without being told to, and that commitment has made the institution greatly relevant in times of chaos. The Rule also had specific ways to deal with the errant monks, allowing for forgiveness and reconciliation. For, as Justo Gonzalez says, “the Rule is not written for venerable saints, such as the heroes of the desert, but for fallible human beings. This may have been the secret to its success.” (Gonzalez, The Story of Christianity, Vol. I, 279). Now, we all know that most Christians are not called to be monastics. But, that’s not to say we can’t learn from, and even use, the practices of our monastic brothers and sisters (forefathers and foremothers). Benedict called for both spiritual and physical discipline. Discipline – not a word we often react well to. *What does discipline mean to you? Are there disciplines (mental, physical, spiritual) you already practice? Many of us do actually practice disciplines – whether it exercise in the form of gardening or walking dogs; whether it’s night time prayers or early morning Bible studies; whether it’s keeping a weekly Sabbath (rest day). The happiest and most well-adjusted people have disciplines in their lives. And our disciplines need not be unduly harsh (you don’t have to forever give up ice cream or wine – just do it in moderation. You don’t have to run marathons – just walk and jog enough to stay healthy. You don’t have to pray every Daily Office – just make time for God every day). And who knows, once you start a discipline, you might just like it enough to expand it. As our disciplines become part of our lives, they become higher priorities – maybe higher than, say, our favorite TV drama or that extra hour of sleep. Now, to be fair to you all – I am coming to you as a fairly undisciplined learner myself. Tonight let’s learn together. I’ve brought you a few thoughts on Benedict from a mother and blogger who loves all things Benedict. Let’s make this guy modern and outside the monastery walls. What can “the rest of us” do when we don’t cloister? This mom has some thoughts. Now, I want you to break into 3-4 groups. Each group will get an article about Practicing Benedict. I want you to read through it, and when you’re done reading, I want you to list 5 ways you can incorporate this Benedictine idea into your daily lives. When we come back together, we will discuss some of what we all came up with. What did you find most intriguing about this part of the Rule and Micha’s thoughts on it? How can you apply it in your daily life? We’ll begin with Group 1, Nothing Harsh, There’s Enough Time. 2, Silence. 3, Prayer and Rising Immediately. 4, Hospitality. Perhaps there is enough time – when our lives are centered properly. Perhaps we can not only fit in prayer, but make prayer central to our daily lives. Too often, I hear of Christians trying to do a 5AM Bible study every day when their job keeps them up until midnight. Or I hear of people struggling to find silence in their lives while scheduling themselves to death. But I think Benedict’s right: there is enough time. There always has been. We just have to find and use discipline to realize it. Benedict was reasonable (okay, well, at least for a monk!). We need to also be reasonable. We need to know our limits, prioritize sleep, not overdo the scheduling, and make God and relationships the priorities in our life. We are not defined by what or how much we do. We are who we are because God loves us so much and puts such priority on God’s children. There’s no need for undue harshness, but there is a need for discipline. I pray we take tools, like those Benedict provides for us, and begin to re-order our lives around what should already be central: God’s love for us and our response to it. In a recent post about the competing op-ed pieces about Liberal Christianity and Conservative Christianity and whether either can be saved, Rachel Held Evans once again spoke my mind for me in so many ways. Her articulate piece outlines the good and the bad of both Christian “camps” in this nation, and outlines pretty well where I sit – right in between the two. Her truths about what both sides have and lacks were spot on. I applaud her for seeing good on both sides. I was raised in some very conservative churches, where I learned a heaping knowledge of scripture, studied my faith diligently, and became a Christian whose faith genuinely mattered to her whole life. But, I was also told women couldn’t be preachers or leaders or even deacons. I was confused about what I might do with my life when I felt called to ministry. I faced a LOT of guilt over the most normal of life’s happenings. I loved science and marveled at how much, and yet how little, we know about the magnificent creation we see – and I knew that the earth had to be more than 6,000 years old. Then, after much turmoil and leaving church for a spell (like, most of college), I found the progressive movement in the Baptist world – the Cooperative Baptist Fellowship (and the American Baptists, who I knew existed, but wasn’t familiar enough with; and the Alliance of Baptists, which even in the middle of seminary struck me as very far from my Southern Baptist upbringing). I learned that women were welcome in many pulpits, my calling was fully embraced, and I was allowed to doubt and not be judged. I also learned that progressive Christianity lost much in Bible study to gain in social ministry, and lost much in personal piety to be replaced with philosophical debates and a lot of intellect. I believe in the movement of the Spirit, and sometimes (though luckily not often), this was quashed by the amount of thinking my classmates and I did. And I believe the Bible needs to be taken seriously – all the time. I believe in miracles, the bodily resurrection, the movement of God in personal lives through scripture study…things that are often challenged in the more intellectual “liberal” extreme. (Because, as Evans points out, we are describing the extremes, not the middle ground). Neither extreme has a good mesh of the holy and the intelligent, of the ritual and the free Spirit. And both have lots to learn from each other and must meet those of us in the middle to do it. Evans’ exact words were “Missing from the whole dialog” [between the and conservative and the angry liberal Christians] “was any sense that we’re in this together, that, as followers of Jesus, we may need to put our heads together to re-imagine what it means to be the Church in a postmodern, American culture where confidence in organized religion is at an all-tie low.” She gets it, too, as she has left the church and been unable to consistently attend a church since. While I hope for nothing more than her resolution to the issues she faces in finding a church, I suddenly became aware that I already have that church…and have had that church for some time. Now, to be fair, no church has it all figured out. The two churches where I have actively attended in the last five years (first church 2007-2011 & second 2011-now) have messed up, done horrible things, and been absolutely wrong on some things (both in the leadership and the lay persons). But, on the whole, at least while I have been a member of these churches, I have seen two groups of faithful Christians who differ widely on topics of theology to politics to the color of the sanctuary carpet, come together in fantastic ways to love and lead in their communities. And also to be clear, one church leans slightly right, the other slightly left. But I feel at home in both – because they hold in utmost importance the message of Jesus and the promise of God’s present and coming kingdom. They think through things, ask questions, and try their best not to assume. They forgive those who’ve really messed up. Neither church actively turns away or shuns the pregnant teenager, the divorced, the cohabitating partners, or the poor. There are a majority of members who would drop everything to come to the aid of anyone in the community. My “home” church is famous for their actions after major storms – they are first-responders who make a mission of helping others when all seems lost. They do the back-breaking labor of love to saw trees and pick up the pieces. My current and new “home” church gives up their space regularly to minister to the downtown homeless. They wrap their arms around the outcast and welcome them with open arms into the service and work of the church. And in both churches, I see the face of the Living God at work in the middle of humanity’s local affairs. Yes, both churches support overseas missions through their respective denominations. Both churches send missionaries to foreign lands. (And those works are deeply important to both denominations and their members). But most importantly, as Baptists, they plant themselves in the middle of a local area and get to work with both feet on the ground. They brush off differences in order to work among those in need in their immediate midst. They give their all to active love and put theology to the side while they work – this is something to be commended for. Not all Baptists make this work so well. Baptists are, by nature, a bunch of staunch individualists. We each read and interpret the Bible in our own way. We are holy priests and mediate our own relationship with God. And as churches, we are autonomous units designed to function in a specific locale. And the only way for a Baptist church to stay whole (yes, some do manage to stay whole…at least for a period of time! ), we must hold together the dissenting opinions. We must give and take on all decisions. We must be willing to be wrong and humble even when we feel sure we’re right. We talk theology and politics in a way that helps us all to grow and not in ways that divide the house of God. And when we do that, and do it well, the Kingdom grows. God’s people learn, and we all become better disciples. I pray more of our churches and those caught in between these ongoing left-right debates would find ways to work together to reach that many more people with the message of hope, promise, inclusion, and love that Jesus so freely offered us. My friends to my right and to my left, in my denomination and not, I pray we do this as a team – with humble hearts and forgiving spirits. The church at its best is a humble group of people seeking to live as Christ, continually uplifting one another, and finding ways to make our differences teach one another about the good and bad of our own theology and traditions. The Kingdom of God is so much bigger than our biggest differences, and it deserves our best effort at working together. It’s summertime. People are wearing fewer clothes and feeling more and more aware of their bodies (and probably more aware than they want to be of others’ bodies!). In this place of awareness, we will take a moment to think about our bodies and how they relate to our faith and relationship with God and others. In a recent discussion with Melissa Browning at the Sexuality & Covenant Conference in Atlanta, we were faced with what she called a “Theology of the Body.” Now, to be clear, this is no new theology. John Paul II had pages and pages of papal encyclical to discuss a theology of the body for the Catholic tradition. But hers was a bit more nuanced and definitely differed from JPII. What do you think about our bodies as intertwined with our souls, rather than apart from them? What did the Hebrews think about souls? The Greeks? What do we do with all of this? What about Jesus’ incarnation – his human body? Being full divine and fully human all at once – did that say something about God’s valuing the human body/condition? Paul, who was famous for struggling against unnecessary desires, just like his Greek contemporaries, still saw the body as integral to the worship and love of God, just as his ancestors before him. For Paul, the body was a temple we should care for. And I might add: love & cherish our bodies, as we are made in the image of God. But what does this mean – the image of God? I mean, weren’t we always taught that the image of God really was not an image at all – that is was some sort of spiritual likeness? Do we actually LOOK like God, FEEL like God to the touch – do we RESEMBLE God?? Some theologians say that maybe we do – they discuss a striking anthropomorphic depiction of God. There’s not a lot to that scripturally, but it has been thrown out there as humanity has tried to figure out what our bodies have to do with our faith. Hmm. So, we are to live in relationship like God does. I mean, God is Triune – God is in relationship with God the father, son, and spirit, along with humanity & creation, all in self-giving love all the time. Wow. That’s a lot to ask. But ask is exactly what Jesus did when he commanded us to “Love Your Neighbor As Yourself.” That’s a bold statement. It assumes we love ourselves – because we know our bodies are made in God’s image. It assumes we recognize that we have neighbors who are also created in God’s image. And it means we use our bodies to actively pursue relationships with these neighbors (friends and enemies alike) in order to become more like God-in-relationship. No, I’m not going to give you a long list of things we should/shouldn’t do to our bodies. We have lots of scripture and modern science to help us sort through that, and it would simply take too long for a single lesson to go over it all. But based on what you know about our bodies and how they should be cared for and used, what are some ideas you have about what you can do this summer to better use and protect your body in service to the Kingdom? Can you better love your neighbor by going to see them physically? Can you better serve your community by being the “hands & feet” of Christ doing hands-on ministry? (There’s that metaphor again!). What about caring for your body in such a way so that you physically CAN do things for/with Christ? (I’ve quit preaching and gone to meddling…sorry, guys). Take your time this summer. Care for yourself and others. Yes, vacation weeks and summer camp weeks might be hectic. But most of us have a tad more down time during the summer. The days are long, and we have choices about how to spend our time. Make choices that honor God with your body. Try to integrate your faith and your body more mindfully – you might just be surprised at the grace it can offer both you and those you are called to serve.